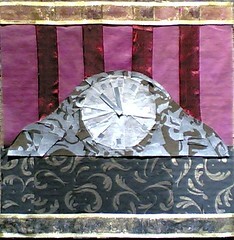 Here is my clock collage as it looked when I had finished working on it yesterday. For the area underneath the clock, I decided to use a printed paper napkin that I had at home (part of a set received as a gift). I cut the napkin into strips and pasted them down. Then I added the two strips of gold mesh ribbon that my daughter had saved for me. Because the ribbon is transparent, I used acrylic gel medium for the glue. It will be completely clear when it dries. Later, I will coat the entire collage with acrylic medium, but it is easier to photograph before it is coated. I decided to take a picture of this collage in the sun that was coming through the windows at Red Brick, and I think it is easier to see this way. When I returned to Red Brick to work on my collage, I concentrated on the clock's face, for which I used paper cut from a coffee filter. 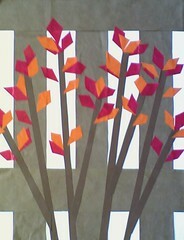 As I pieced the circle together from triangles, I liked the effect of the overlapping pieces of paper. The reflection makes it hard to see in the photo, but to suggest the numbers on the dial and the hands of the clock, I used silver ribbon (courtesy of Chico's I think). I worked a bit more on silver body of the clock, and then it was time to stop for the day. The area below the clock is the cardboard that I used for backing (courtesy of Amazon packaging!) I left for home without any idea what I was going to do with that area of the collage. To be continued. . . This is the new collage I started on Tuesday. It is almost time to turn the calendar to 2007, and I was thinking about making an image of a clock. I had a particular clock in mind, a little silver desk clock that I received as a gift several years ago. I took a good look at the clock before I left for Red Brick, and then worked from memory. I cut the shape of the clock out in brown pantone paper, thinking to make a wooden clock. 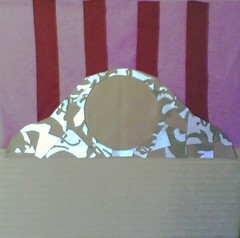 But then I decided to use some silver and brown paper (from a J. Jill shopping bag). 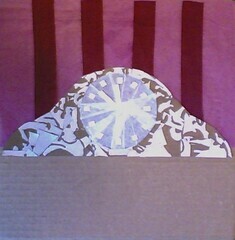 I drew a circle for the face of the clock, and pasted the patterned paper around it. Then I started the background with ribbon (also from the same shopping bag) and pink tissue paper that my daughter had saved for me. This is what it looked like at that point. That is as much as I had time to do, but I had done enough to see that the idea might actually work. To be continued. . .
Over the weekend, I had an idea for a new collage. So I went to Red Brick on Tuesday with that new idea in mind. But before starting something new, I wanted to do some work on this collage, which I started back in November. So I added more leaves, trying to balance colors and shapes. I was happy with how it was going, but after a while, I began to feel I was rushing because I wanted to get the new collage started. So I stopped right then and switched projects, and will return to this one soon. Sometimes if you rush to try to finish something, you aren't careful enough and can ruin it at the last minute. So this collage is still a work in progress. To be continued. . .
Sunday was a great day for a morning trip to Cambridge. Because it was Christmas Eve Day, the Harvard Bookstore opened at 8 AM. We got to Cambridge early enough for coffee at Peet's, then it was time for the bookstore. (I bought Hockney's book SECRET KNOWLEDGE, about the old masters and optics: very controversial but fascinating.) 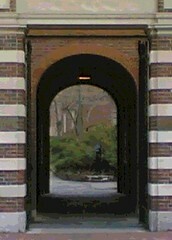 As I left the bookstore, the building opposite, with its archway leading to campus, caught my eye and I took some pictures. Tonight I chose the photo with the best geometric composition, then cropped the image to focus only on the archway and the view beyond. Then I posterized the image in Painter IX, adjusting the levels to get the amount of detail I was after. Hockney has interesting things to say about photography, painting, and computers, ideas relevant to the kind of manipulation that programs like Painter make possible. 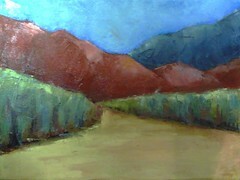 I started this oil bar painting about six weeks ago at the first session of a class I have been taking at Red Brick. During the final class meeting (December 18th), we had a demo of glazing with galkyd. 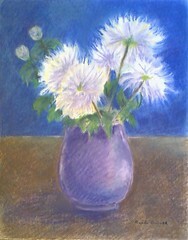 I only had a short time to try glazing that night, so I added a little blue-green to the vase and background of this painting. But a few days later, I went back to Red Brick and continued glazing on my own, adding some purple to some of the flowers. (Some of the flowers in the still life set up were really red heading towards purple.) I also added some purple to the background. I was having so much fun with this new technique that I decided I had better stop a bit before I glazed everything in sight. Last Monday night was our last oil bar class. Towards the end of the class, the teacher demonstrated using galkyd and wax to glaze oil bar paintings. Because glaze has to go over a dry painting, I decided to try glazes on the painting I did during the very first class. Glazes can add color, so this was great because I was struggling with limited colors that first night. Glazing would let me add some of the colors I saw in the still life, but could not manage to mix in paint. So with only had a few minutes left in the class, I mixed some soft greenish blue with galkyd and used it to color part of the vase and the upper right hand corner of the background. I liked the effect and knew I wanted to do more, but it was time to pack up and go home. To be continued. . . 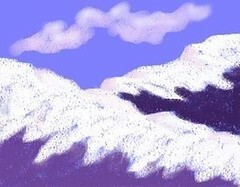 This landscape is a piece of digital art that I created recently using Painter IX's digital pastel. I decided to use this image for holiday greetings. This is the painting I was working on in my oil bar class last Monday night. I have not worked on it since then. But I did decide to photograph it again and re-post. At the end of the class, I was in a hurry and took a quick photo with my phonecam, but the paint was so wet that I was getting too much reflection from the overhead lights. A few days later, I went back to Red Brick to work on other projects, and while I was there, photographed this painting again, this time in daylight, to get truer color and a lot less reflection. So this is really how the painting looks at this point. I am going to keep working on it. To be continued. . . This morning I went back to Red Brick and used the time I had to finish up this drawing. I shortened up the two buds just a bit to make the perspective more believable. Then I worked on the vase. I checked the shape of the vase by turning the drawing upside down and also by holding it up to a mirror. Then I added depth and reflections. I also finished up the background. Although experience tells me that I may see something in a few days that I need to change about this drawing, it is basically finished, so I signed it. I think I might donate this drawing to Red Brick for their Art Auction in January because the theme is "bleu". Today I went back to Red Brick and worked on this drawing a bit more. 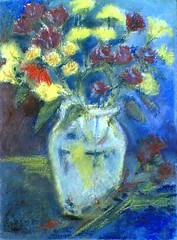 I added shadow to the vase, then worked on the background a bit. It is not quite finished, but I can tell that I like the composition better now. This is my pastel makeover after one drawing session. My goal was to resolve the off-center composition. First, I widened the vase on its left side, moving it closer to the center. But the flowers were still off center. I did not want to draw more blooms because I had drawn these from observation. Anyway, it would have been impossible to get the same bright white, which you can only get by letting the white paper show, because I would be drawing into dark blue pastel. But to balance the composition, I needed to balance the left and right margins, so I added two buds on the left. I figured that the buds are usually a bit darker than blossoms, and because of their position, they seem to recede, which would make them look darker anyway. And buds are simple to draw. Why two buds? Maybe to echo the two blossoms on the other side. I added some leaves, guided by the shapes of the leaves I had previously drawn from observation. That was all I had time to do, but this is still a work in progress. The white mums are finished just as they are and I do not plan to touch them. But I still need to work on the buds, leaves, vase, and background (some of ended up on my sleeve.) To be continued. . .
Several years ago, I was part of a drawing group; one artist would host, and we would get together and draw in the evening. 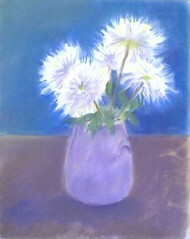 I always worked with pastels, snagging any available flowers or fruit for my still-life setup. Time was always limited (we worked for two or three hours only) but I produced a number of good drawings with that group and really enjoyed their company. 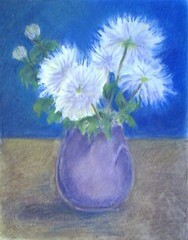 The other day, I came across three or four pastel drawings that I had started with the group but had not completed. 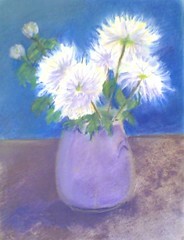 This drawing of white spider mums is one of the pastels, and it really caught my eye when I found it. I really like the white flowers against the blue, but why hadn't I finished it? Well, time of course, but also the composition, which is obviously off center. No doubt I was so excited about the white flowers that I didn't notice till it was too late! I remember putting the drawing aside, thinking that sometime I would crop it to fix the composition, and then finish it. But when I found it last week, I decided to make it a project and do a make-over: take it to Red Brick, finish the drawing, and try to solve the compositional problem but without cropping the image. This is the BEFORE picture. To be continued. . . I worked on this painting again tonight in the oil bar class I am taking at Red Brick Studios. I made the colors more complex (for example, put red and purple shadows in the green foliage). I also added areas of light. This week I worked only with the palette knife, rather than a brush. 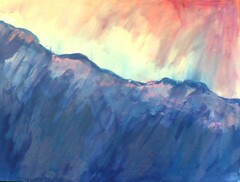 The palette knife produces more interesting textures and also forces me to mix colors right on the canvas. I could have worked on this for another hour, but it was time to stop. I took a quick photo with my cameraphone; the wet paint caught some reflected light (upper left corner), but this photo still gives a pretty good idea of what the painting looks like now. Although this was the last session of the oil bar class, I will keep working on this painting. Here's another photo from Long Hill Gardens. 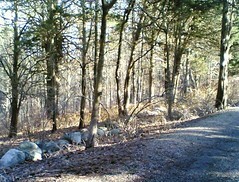 I liked the way the winter light hit the trees, and the typical New England stone boundary at the side of the path. I took a picture with my phone cam. Today I edited the picture, cropping it to capitalize on the long diagonal line of the road. The weather has been warm this week, good weather for walking at Long Hill Gardens. When we were there this week, the light was amazing. 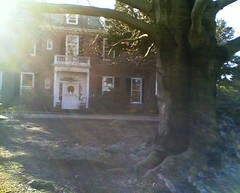 When we passed the house and the old chestnut tree, I took this picture with my phonecam. Although I was in a hurry when I took this picture, I like the effects of the light in this image. This morning I went back to Red Brick to finish up this collage. 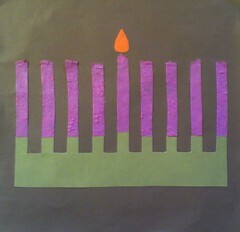 I used red paper on the flames, then pasted yellow paper against the green to make the menorah look like brass or gold. I liked it but decided that I wanted the candles to be brighter than everything else, so I pasted little pieces of yellow paper in the flames. 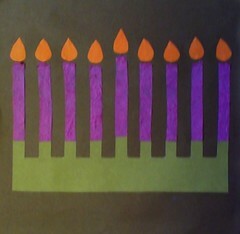 I am going to use this image as is for Chanuka greetings. Later I plan to coat it with acrylic medium to finish it, but the image photographs better without the acrylic coating. Yesterday I had a meeting at Redbrick, but I arrived early so I could go up to the studio. I didn't have much time, but I did manage to cut out the shapes for the flames and paste them down. 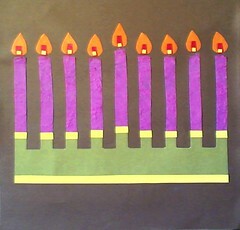 Yesterday I woke up with the idea of making a menorah with collage, to use for my Hanukah e-mail greetings this year. I was heading over to Red Brick Studios, but only had a short time to spend there, so I decided to get this collage started. (I always seem to begin with the delusion that collage is faster than painting.) I began by pasting brown pantone paper onto cardboard for the background. I also used pantone for the menorah, which was great because the paper has a grid on the back which made it pretty easy to cut the menorah in one piece. Originally, I was thinking of the little flat menorahs for children; those usually have the highest candle off to one side. But I decided to put the highest candle in the center, for the sake of the composition. Then I cut the candles out of some nubby pink paper. By the time I had those pieces cut out and pasted down, I was out of time for the day. But I couldn't resist pasting just one flame onto the collage, to see how it is going to look. 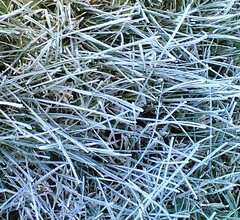 This morning we had frost on the lawn and I loved the color and texture in the early morning light, so I took this picture with my phonecam before I brought in the newspaper. Tonight I cropped the image to get an even closer view. This is a painting in progress that I started last night in my oil bar class. 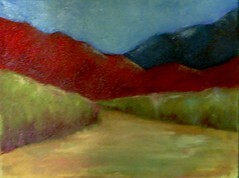 The instructor suggested starting a new painting that uses the same composition as one I painted a few weeks back, "Mountains and Field", but changing the colors and using a bigger canvas. One of my college painting teachers used to say that I should use a color that is out of my comfort zone, because it would give me a problem that I would have to solve. That is certainly true in this case, and I will have to work hard to solve this one! But meanwhile I am having fun figuring out how to mix a lot of colors with oil bars. I was making the sky lighter towards the end of the class, and just as I had decided to add light to other areas, it was time to pack up and go. So I made some quick marks with the brush to indicate where I wanted to put more light next time. Then I took a quick picture of the shiny wet canvas with my phonecam. To be continued at next week's class. . . This is the portrait I have been painting for my friends. Today I changed the shape of the chin just a bit. Then I modified the relative size and position of the eyes; this helped a lot with the 3/4 view perspective. This is the version that I am going to send to my friends. Tomorrow I will have a digital scan made of the image. Then I will seal the sides of the canvas so the portrait can be displayed without a frame. Then I will get it ready to mail to my friends. Today I made a number of small changes to eyes, mouth, and hairline to improve the perspective for a 3/4 view. Then I finished painting the nose, making the tip more rounded. I lightened the area under the nose. Then I added some tiny shadows to the mouth that brought out the expression in the smile. This is almost finished, just a couple of small adjustments to make tomorrow. . . .I have been focussing on this painting all week because I am trying to get this mailed off to my friends in time for the holidays. I worked on this portrait again today. I adjusted the shape of the face by moving one line, which really helped with the three-quarter view. I also softened the nose and repainted the neck. Then I added the necklace. There may be a few small changes ahead, but we are getting close. . . . I worked on this portrait again today, making another round of small changes. The main changes were to shorten the chin even more, and make the nose look slimmer and shorter. Although I have a few more changes to make tomorrow, I think this is almost finished. I hope to mail this to my friends in time for the holidays. Today I made some changes to the portrait I am painting for my friends. I shortened the nose and the chin slightly to get the proportions right and improve the likeness. You can still see strong shadows where I made changes; I still need to lighten those areas because the shadows make the features look too sharp. Tomorrow I plan to reduce the size of the chin just a bit more. At this point, I try to keep the changes I make to between 1/16 and 1/4 of an inch at a time, because small changes make it easy to follow the lines that are already there, and also make it easy to reverse a change if I make a mistake. In a portrait, everything is related to everything else. A major change in once place can start a domino effect, so I move slowly and carefully. But small changes are important in a portrait, so it is worth the effort to try to get it right. Over the past few days, I have made several small changes to the portrait, moving slowly so as not to lose the likeness in the process. I made a number of changes to hair and teeth to get as natural a look as I could. Then I raised the hairline and moved the eyebrows and top of glasses down a bit. Each change was only between 1/16th to 1/4 of an inch, but the cumulative effect was to change the proportion of the eyes slightly. I made the lower half of the face slightly wider. Then I made the space between top and bottom lip slightly larger, and extended the corners of the mouth (again, by 1/16th of an inch). This made the mouth look slightly wider. Even though it is hard to see each change, I think all these modifications improved the portrait. This is a painting I worked on in my oil bar class tonight. I am still concentrating on learning to mix colors. Earlier in the day, I picked up a couple more oil bars to make it easier to do. I thought I would see how many kinds of blue I could make. Then I decided to work on the small 8 x 8 inch painting for the Red Brick Auction because the theme is blue. 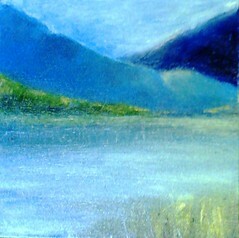 I had been thinking of doing a painting of a mountain lake. Although I had looked at some of my Colorado photographs (trips to Dillon Lake, etc. ), this image is from imagination and memory. I don't know if this little painting is finished, but this is what I was able to do in tonight's class. This is the portrait I am painting for my friends, as it looked two days ago. I am still trying to get the teeth the right shape and color. I added more lines to the hair to get the right texture. Things don't naturally look natural in a painting; you have to work at it. 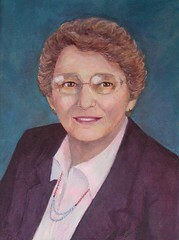 Although this portrait is almost finished, it is still a "work in progress". In fact, there is a more recent version which I worked on today, which I plan to post after my friends have had a chance to see it. Yesterday I put the finishing touches on this painting; I added some pink to the mountain peak on the left side, just to complete the line of the mountains. Then I hung it up, just in time for the Red Brick Open Studios today. This is the portrait I am painting for my friends. Over the past few days, I have been working on details, especially hair and mouth. I dated this November 30 because I worked on it again tonight and there is a more recent version, but I am not ready to post it yet. So this is still very much a work in progress, with more changes ahead. But it is really worth it to get this right. Small changes can make a big difference in a portrait.